The Independence Palace, formerly called Norodom palace, today known as the Reunification Hall, is an architectural constructions in Ho Chi Minh City. In 1868, the French government began to design and build in the center of Saigon a mansion for the Governor of the Southern States, called Norodom Palace. From 1887 to 1945, generations of French governors have used this mansion as a residence during the invasion of Indochina. 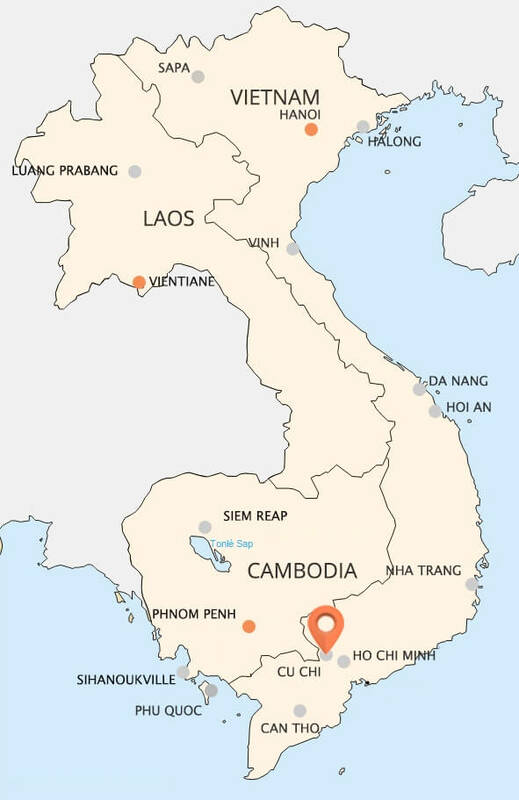 On 7/9/1954, Norodom Palace was handed over by the representative of the French government, General Paul Ely to representative of the Saigon government Prime Minister Ngo Dinh Diem. Then he has decided to rename it as Independence Palace. 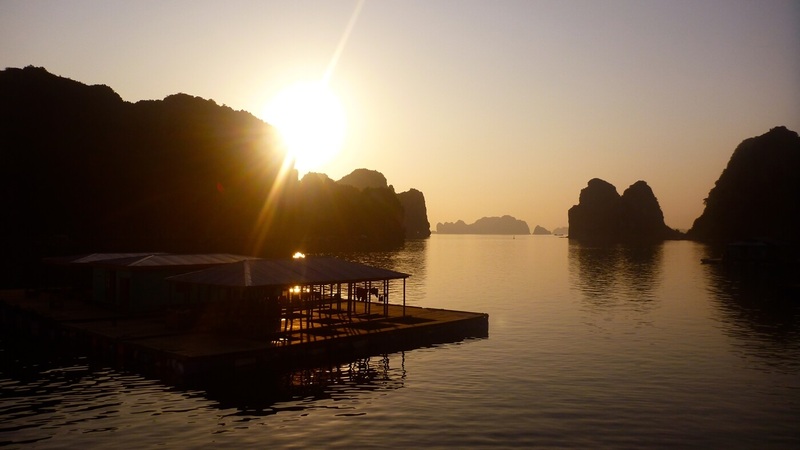 Since that time, it became the residence of Ngo Dinh Diem family and a witness of many political events. This palace is a unique architectural constructions of architect Ngo Viet Thu. He harmoniously combined European modern architecture Orient with traditional architecture. Inside the Palace, all the architectural lines are very subtle and modern. Outside, the front yard of the Palace is an oval lawn with a diameter of 102m. The green of the grass creates a sense of calm and fresh for guests when they walk through the gate. Running along the whole width of the hall is a semicircle lake. Lotus and lily in the pound evoke images of a quiet lake in the temples and pagodas in Vietnam. 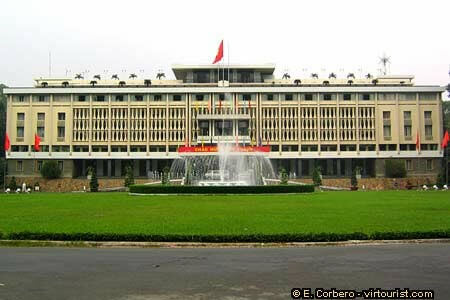 Thanks to the sophistication in architecture and long history, the Independence Palace deserves to become a unique symbol of Ho Chi Minh City. 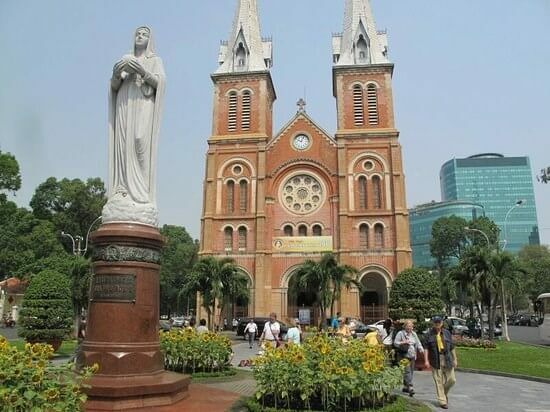 Notre Dame Cathedral of Ho Chi Minh City, full name of Immaculate Conception Cathedral Basilica, is one of the first Catholic cathedrals in Vietnam. 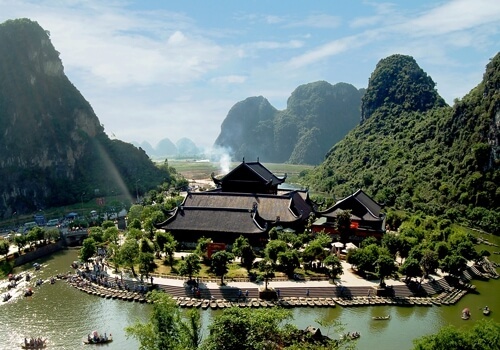 It is also an attractive destination for domestic and foreign visitors. Shortly after invading Saigon, the French started to build a cathedral as a place of ceremonies for Catholic Frenches. In three years, the building had been finished in 1880. At that time, it was called by the name “Govern Cathedral” because French government paid for the cost of its construction. During the hole constructive procession, all materials were brought from France. The outside bricks of the building are still keeping their unique color depite of being bare, unshaded warrant in many years. And a special detail that this cathedral don’t even have surrounded fence like architectural style at that time. Walking inside, the decor characterizes for Catholic European church but still certainly remains an invidual beauty. There are twelve main rectangle pillars, devided to two sides. Each side has 6 ones to symbolize six apostles. It is the architecture of the church made a great lighting effects in the interior, giving a holy and solemn sense. Subtle lighting also make details inside the cathedral more beautiful. Ho Chi Minh Municipal Theatre, or Saigon Opera House, is located on Dong Khoi Street, District 1, Ho Chi Minh City. 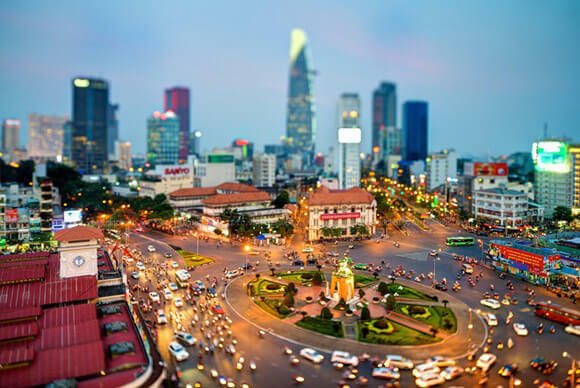 As a center theatre of the city, it is usually the place organizes the biggest events of Ho Chi Minh city. 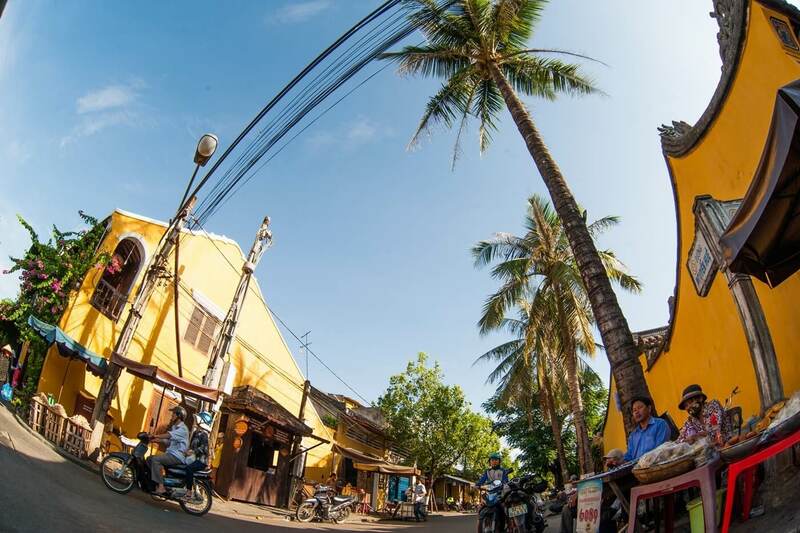 It is also the oldest theatre with European style, a attractive destination for tourist when in Saigon. The Municipal Theatre was built in two years, from 1898 to 1990. At that time, the architecture of this building was a controversial topic. Many people criticized that its architecture was too prolix with unnecessary and backward details, but there were people who loved them and saw them so ancient and romantic. So in 1943, many decorations and sculptures in front of the theater was eliminated to reform architectural style, follow the trend at that time. Beside Hanoi Opera House, Saigon Opera House was a masterpiece of architecture in Vietnam in 20th century. Not only outside, inside the theater are also very modern design, fully equipped with sound and lighting equipment, serves for major events in the city. 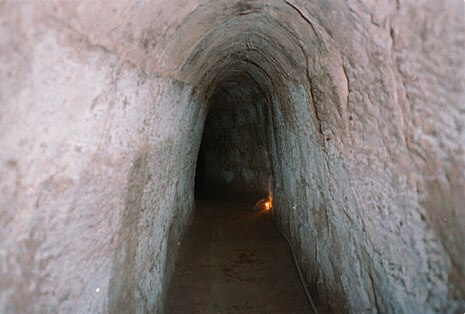 With its ancient and majestic architecture, this is an ideal destination for tourists when coming to Ho Chi Minh City. 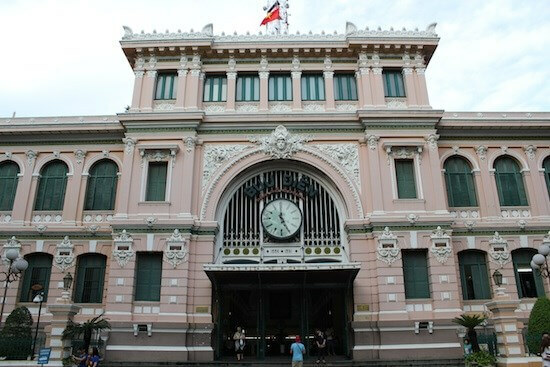 Saigon Central Post Office is located in the center of Ho Chi Minh City, opposite with the Paris Commune’s Roadwork Square. This building was built from 1886 to 1891, designed by the famous architect Gustave Eiffel. In the first time visiting Saigon, tourists all wonder what makes a post office become so famous like that. The right answer is its own architectural style. Saigon Centrak Post Office’s architectural style is a harmonious combination between modern European with Orient decoration. The hightlight of this building is symmetrical layout of the works in high aesthetic. Facades has structural shapes and the arch above the door. Large arch is shored up by four iron pillars in four corners. On the arc is the big clock, an usual characteristic of every post office. Both sides of the building are decorated by the shapes of men and women wearing diadem in each rectangular box, with the table carved names of many French celebrities like Laplace, Voltaire, Arage,… Inside the post office, at any angle yet, travelers also catch a glance at the former Saigon. With its unique design from inside to outside, the building Saigon Central Post Office can be considered as a construction with a unique style of architecture, a symbol of Saigon at the time and till today.